Applying transdermal methimazole is as easy as gently massaging inside the tip of her ear. If you're tired of wrestling with Tabby to get her to take her thyroid medicine, you might be happy to learn there's an easier way. Hyperthyroid medication can also be applied to her skin. Tapazole, also known as methimazole, is available in a gel form for transdermal application. Why Use a Transdermal Medication? If Tabby doesn't like taking pills, she's not alone. Just about every cat owner has experience with trying to get a cat to take her medicine. Many cat owners can't pill their cats multiple times a day, as their conditions sometimes require. As a result, some cats aren't treated for their diseases because it's simply too difficult to give them the medication. Tapazole (methimazole) is no different. Fortunately, another choice has been developed: a methimazole gel administered to the cat's ear. Transdermal methimazole is administered to the hairless skin inside your cat's ear tip. The gel is absorbed through the skin into the bloodstream and then goes to work to help adjust the thyroid level. On the surface, applying medication to the skin may be counterintuitive; after all, the basic function of skin is to act as a barrier and protect the inside of the body from what's outside. Transdermal drugs are designed with this in mind: their chemical characteristics, the skin's properties and the substance carrying the drug (the gel, in this case) all affect how well the medicine is absorbed into the bloodstream. Tabby's new form of methimazole will come in syringes, to be dispensed in a dose prescribed by her vet. Your vet will show you how to apply the gel: it involves putting the proper amount onto a gloved finger and rubbing it into the hairless portion of the inside of Tabby's ear. You should alternate ears so the drug is absorbed better and doesn't build up on her skin. Your vet may advise you to clean your cat's ears occasionally with a very mild soap or witch hazel on a cotton ball. It's important that you wear gloves when you work with the transdermal gel, to ensure that you don't absorb the methimazole as well. Studies of the effectiveness of transdermal methimazole vary in their conclusions. 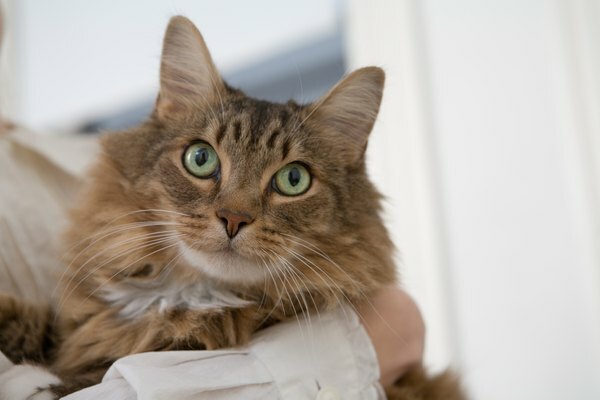 Veterinary Practice News notes that it can be an effective in controlling hyperthyroidism, although it can take longer and require a higher dose of methimazole than pills to effectively treat the condition. Dr. Arnold Plotnick of Manhattan Cat Specialists notes that two different studies yielded two different results. However, the bottom line is what is going to work for your cat. If Tabby is resisting her pills, and other treatments such as radioactive iodine therapy aren't feasible, transdermal gel may be a good option for her. Your vet will be monitoring her thyroid levels with regular blood testing, so if the transdermal methimazole isn't working, you'll know and be able to adjust accordingly. Why Do Cats Vomit After Eating? Do Feline Cats Get More Sick When Not Spayed? Do Cats Meow a Lot When They Need to Be Spayed?